Fishing in Alaska is not the same as fishing anywhere else in the world, this is because of the cruel environment and the freezing weather. Microgaming invites you to give Alaskan fishing a try through this immersive and engaging slot machine. Microgaming depicts the Alaskan fishing experience through the visuals and the sound effects that accompany the game. This game comes with a high paying format, the 243 ways to win setup, these ways to win are scattered across the five spinning and frozen reels of the game. 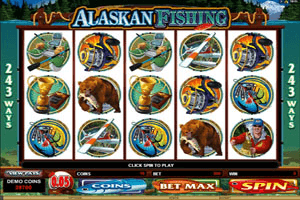 Play Alaskan Fishing Slot here. The icons that appear spinning on the reels of the game include a bear holding a fish, fishing rods, bait, fishing tools, an eagle, the logo of the game and a fishing cup. The bets can be placed under the reels where players will select the number of coins they want to place and the value of these coins. The logo of Alaskan Fishing is the games wild symbol which acts like the joker in a deck of cards. This is because the logo has the ability to increase players’ chances of winning by replacing any of the other non bonus symbols. There are also 2 other bonus symbols, the fishing tool and the fisherman. They can trigger a bonus round and a free spins round.